YOUR DREAM HOME IS JUST A FEW CLICKS AWAY. 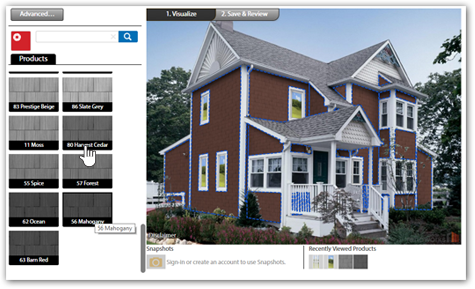 Way-Mar’s Visualizer Tool takes the guesswork out of home renovation planning, allowing homeowners to create, design and customize the home of their dreams. This interactive and user-friendly program features an extensive selection of actual products available from our suppliers. Explore the many styles and ideas that will change the look of your home—from windows, doors and siding to roofing and masonry. Simply choose a home from the gallery of images and design your ideal home exterior. Or, upload a photo of your home and follow the step-by-step process to bring your design ideas to life. Choose from different materials, like blue Cape Cod-style siding to Double Hung windows in Pebble Grey, from Way-Mar’s current line of exterior home products—all at your fingertips. Save your file, print it or share it with your friends and family. When new inspiration strikes, continue working on a previously saved project to add or remove features until you achieve your perfect blueprint. With the fresh, new look of your virtual home complete, submit the “Request a Quote” form and Way-Mar will contact you to help transform your dream renovation into reality.